Pitfall traps can be a useful technique for collecting Argentine ants. In fact, in some circumstances pitfall traps may be better than direct searching, or using baits. 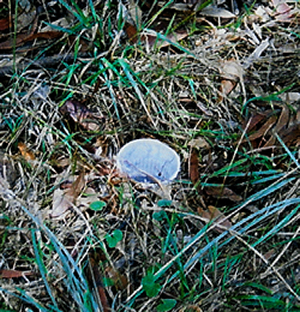 Pitfall trapping involves digging a small plastic cup into the ground, so the open lip of the cup is level with the ground. As ants (and other invertebrates) run along the ground they fall into the cup and cannot get out. A preservative of ethanol:gylcol mix (50:50, or 75:25) is used to kill invertebrates, preserve them from rotting, and prevent them from crawling out of the cup. A few drops of fish oil should be placed into pitfalls traps; this increases attractiveness to Argentine ants. Cups used need to be plastic (to avoid them breaking) but can range in diameter from 3 cm to 10 cm. Cups need to be able to have a lid placed on them, for transporting back to the laboratory. Pitfall traps are usually spaced about 5–10 m apart. Pitfalls traps should be left out ideally for 4 weeks (but can be left out for shorter periods). The chances of detecting Argentine ants increases with increasing duration of pitfall trapping (Stanley et al. 2008). Pitfall traps give information on presence and absence of Argentine ants. In addition, the method can also give a rough indication of abundance. Note: ant abundance is extremely difficult tio measure accurately (because it is so variable), so ant abundance in pitfall traps should be treated only as a rough guide. We do not recommend pitfall traps for surveillance because (i) they involve a significant time investment (both in the field, and for processing samples afterwards), and (ii) they cannot be used in many urban and semi-urban areas as they need to be dug into the ground. However, pitfall traps have a significant advantage over other techniques in that they can be left out for long periods (1–4 weeks). This significantly improves the chances of catching smaller infestations of Argentine ants if they are in the area. The probability of detecting Argentine ants increased 16x with the addition of a few drops of fish oil into pitfall traps. The probability of detecting Argentine ants increased with increasing duration of pitfall trapping (i.e. 4 weeks was better than 2 weeks or 1 week). Pitfall trapping, particularly over 4 weeks' duration, was consistently better at detecting the presence of Argentine ants than baiting.